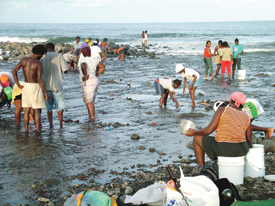 The Tri-tri, or Titirie as it is called in our sister islands of Grenada and Dominica, are tiny fish which are spawned in what we now refer to our âsummer monthsâ and as we see in this photograph taken on Saturday by photographer Kingsley Roberts, brings out entire communities who take part in what is a veritable ritual of catching the tiny fish in sacks from the riverâs bed and cleaning them before dumping into buckets for sale at prices which have now reached up to the pricey EC$5.00 for a tiny cup. We do not complain. The taste is always worth it.